SONS and daughters looking to treat their mum to a special celebratory meal this Mother’s Day (you know she’s worth it!) need look no further than the Italian Bistro in Glasgow’s West End. Proprietor, Nas Aksi, said: “Our special Mother’s Day menu has been conceived to appeal to all mums who enjoy a mixture of Italian classics with modern international cuisine. 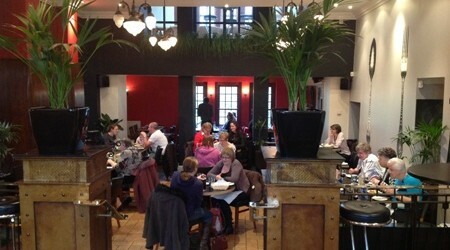 The Italian Bistro’s Mother’s Day menu features starters of: smoked salmon and prawn cocktail; chicken liver parfait; Parma ham wrapped asparagus with a soft poached egg; and goats cheese and caramelised red onion tart. Main dishes on offer are: roast sirloin of beef; fillet of salmon; chicken breast stuffed with haggis or lasagne of wild mushrooms, leeks, asparagus, rocket and parmesan salad. The delicious desserts, meanwhile, are: strawberry and white chocolate cheesecake; apple and pear tart au tain; miniature baked Alaska or a selection of artisan cheeses. The Italian Bistro’s Mother’s Day menu is available for £18.95 per person. Located in a distinctive and stylish historic building on Glasgow’s Great Western Road, The Italian Bistro provides a stylish and contemporary dining atmosphere – the perfect place to take mum this Sunday.